The HTC Sensation XE, the first phone with integrated Beats Audio, promises to deliver “studio-quality audio.” The Sensation XE Android smartphone is the first fruit of HTC’s partnership with Dr. Dre’s Beats Audio, and should arrive later this month in Europe and Asia. Unfortunately, there’s no word on pricing or availability for U.S. audiophiles. The HTC Sensation XE is very similar to its predecessor, the Sensation. It has a 4.3-inch display, runs Android 2.3 with HTC Sense UI 3.0, has an 8-megapixel camera on the back with 1080p HD video recording and dual flash, as well as a front-facing camera for video calls. The XE runs on a faster processor though, a dual-core 1.5Ghz (there’s a 1.2GHz dual core on the Sensation) and it has 768MB of RAM, as well as a slightly larger battery. Besides the faster processor, what makes the Sensation XE special is the audio technology built in. When used with the bundled Beats in-ear headphones (with nice red accents, also present on the aluminum body of the handset), the Sensation XE automatically switches to a personalized sound profile that is meant to significantly improve audio quality, regardless of which music service you use. Once you plug in the Beats headphones in the Sensation XE, you will be prompted to enable or disable the audio enhancements. If enabled, a Beats icon will reside in the notification bar of the smartphone for quick access. It’s unclear whether the Beats audio enhancements will work with third-party headsets. To round-up the experience, HTC is also bundling a microSD card (8GB or 16GB, depending on the region the phone is purchased in) for music storage, while the Beats by Dr. Dre in-ear headphones will serve as a remote control via the play/pause/skip music controls and as a hands-free headset during phone calls. 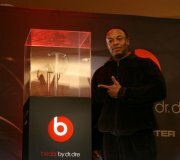 Beats Electronics is a U.S. headphones company rap artist Dr. Dre helped found. HTC invested $300 million in the company last month in exchange for an advantage over other Android handset makers trying to differentiate themselves on the increasingly crowded smartphone market. Beats also has a partnership with HP to build in the technology into the Envy line of laptops, such as the Envy 14.